FISH CAN JOIN YOUR ADVENTURE! In an attempt to ward off predators, schooling fish swim in groups or schools as a way to look bigger than just one fish. In the wild, schools of fish may contain billions of fish and stretch for many miles. The disadvantage of the schooling behavior is that the fish are easily caught in nets. Fish represent 50% of all vertebrate species, outnumbering all mammals, birds, reptiles, and amphibians COMBINED! This fish is a master of camouflage and its frilly appendages help it to blend in with its surroundings. Their dorsal spines are venomous and can be painful if stepped on. These eel live in colonies of thousands of individuals. They rarely leave their burrows so they rely on the ocean currents to bring plankton to them for feeding. 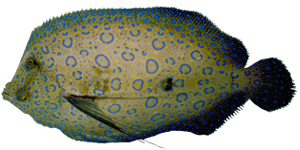 Flounder begin their life looking normal, then one eye migrates through a slit in the head and settles next to the other eye. Depending on their eye orientation flounder can be right or left handed. Sign me up for Ripley's News & Offers. Sign up for Special Ripley's news, discounts, and special promos! You will receive an email notification to confirm your consent.